In a skillet on the stovetop over medium heat, drizzle a little olive oil in the pan. Place chicken breasts in the pan and cook for a minute or two. Add in white wine and cook chicken until golden brown. In a large bowl, place diced Roma tomatoes. Add in chopped basil, diced garlic cloves, diced onion, ½ c. goat cheese crumbles and olive oil. Mix. Add in garlic salt to taste. Set aside. On a pretty plate, place cooked chicken breasts. 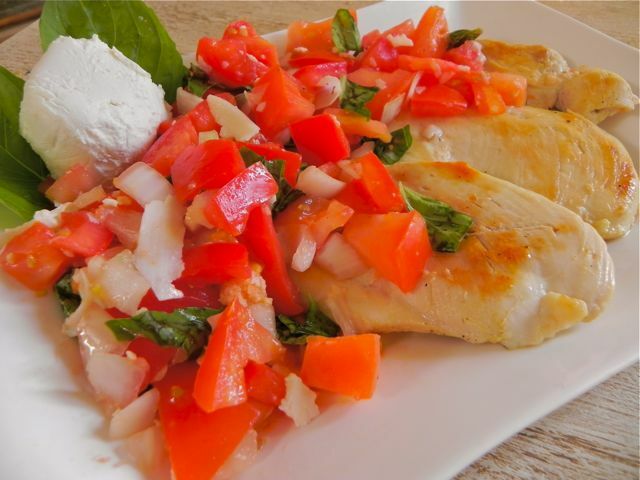 Top chicken with tomatoes, basil and goat cheese. Sprinkle the rest of the goat cheese crumbles over the top. This dish is wonderful served by itself and/or with pasta or rice. (For gluten-free options use rice or rice pasta).